Even if you saw DEJA VU starring Denzel Washington in the movie theatres-- or on an airplane...let me tell you the DVD is well worth the rental price...or purchase...blogged by Joyce Schwarz, www.hollywood2020.blogs.com. 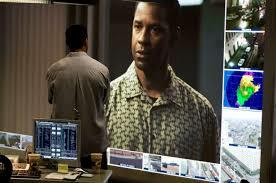 Here's a pix below from www.thecia.com.au (the Cinematic Intelligence Agency-- really believe me). Ultimately, over 500 hours of footage were shot that would be edited and projected in this time-window lab set. Complete credits for World Trade Center 7Architects : Skidmore, Owings & Merril LlpArtist: James Carpenter Design Assoc. Because it indicates where public space 'entertainment' is going...it is leading the pack. It shows how shapes and lights and visuals and sounds (not in this one) can entertain. It is part of what the digerati have called MoMeSo -- Motion Sound & much more..I've written about this before. Do a search on google for it and you'll see. This is the kind of thing that may be on our LED screens in our homes or in public spaces soon....our walls are not going to be white in the future -- unless you want them that way of course! ENJOY. js. What did you do last night...at www.hollywood2020.blogs.com, we created a new visual icon for our blog-- it's called a MICON....from www.micons.com by Joyce Schwarz....here's a link to more info about MICONS...On their site they say "The Mikon Machine gives everyone an easy way to create great-looking images. It's the most advanced drawing tool of its kind available on the internet." www.hollywood2020.blogs.com has a new MIKON from www.mikon.com -- what do you think of it?